Nonprofits and experiential social media shares how nonprofits can improve their social media results and why I think experiential social media has an affinity for cause-focused organizations. This post was triggered by my insights from my recent research on nonprofits and cause-focused organizations. Although I’d served nonprofits throughout my consulting career, my focus was on commercial firms. While organizing Chicago Social Empowerment [Cohort One], I researched many nonprofits to distill the cohort’s categories, so I learned more about nonprofit operations and business models. First, I’ll share some broad insights about nonprofit operations and business models, specifically focusing on their stakeholders, and broad guidance for improving their results with social media. Then I’ll share insights about experiential social media and why I hypothesize that it has a special affinity for nonprofits. 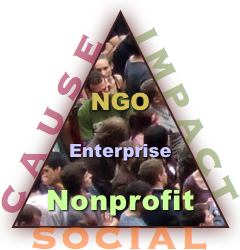 For brevity, I’ll also use “nonprofit” to refer to social enterprises and other cause-focused organizations.